The new iPad? Meh. I'm running Visual Studio 11 on Windows 8 (64-bit) on my tablet. Yes, my tablet. While the technical press spent most of last month fawning over the new iPad and its "retina" display, my retinas were enjoying a much deeper level of techie satisfaction. 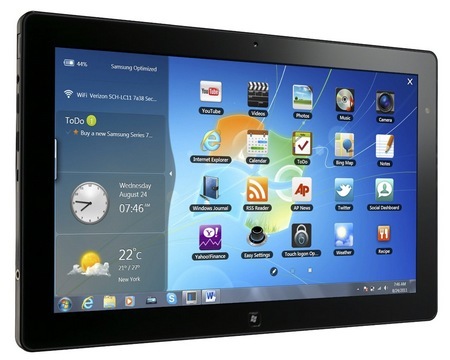 I was running full scale Windows apps, such as Visual Studio, on the Samsung Slate 7. The Slate, an Intel-based tablet, was recently released with these hardware specs: an Intel Core i5 Mobile processor, 4GB RAM, and 128 GB SSD. It's an 11.6-inch LCD display (1366 x 768), so somewhat larger than an iPad. Unlike the iPad or, in fact, most other tablets, it has an HDMI and a USB port. The Slate also has a docking station with two USB and an Ethernet port. So, as you can tell, it's a true PC in the form factor of a tablet. The picture below confirms this. The docking station is the hardware interface of choice when you're using the Slate as a PC, as the various ports enable me to plug in a regular-sized keyboard and mouse. (The latter two components can also connect via Bluetooth.) And if the display is too small for me (although it's quite legible as is), I can use the HDMI port to drive a monitor. Then when I'm ready to go mobile, I can unplug everything and use the Slate as I would any tablet: to check mail (from within Outlook), surf the web, listen to music, and watch films. The one big difference from the other tablets is the software. I don't have to use iTunes to access my music. In fact, because the filesystem is not obscured by the UI, I can manage my music and videos as files and play them as I wish with standard Windows players and tools. I'll stop giving you hardware envy, and now discuss the downsides. The Slate weighs about 7 ounces more than the iPad 1, which still puts total weight under two pounds. This is great for a PC device, but limits the product's use where holding it for long periods is typical (book reader, photo viewer, etc.) Without a keyboard, it's very hard to do right-clicks and frequently difficult to zero in on specific tabs. For this problem, Samsung includes a stylus that helps you accurately tap on what you want. More to the point, when the Metro UI of Windows 8 is used, it obviates all these problems: The big, blocky, colorful design of widgets and apps mean that navigating is easy without having to take careful aim or right-click. So, what does this tablet have to do with software development? Lots, actually. If you subscribe—as I do—to the belief that high-end tablets will inevitably overlap with PCs in terms of performance and capability, then the Slate represents the future today. It also means that insofar as tablets are concerned, the current model of downloading mobile apps will be supplanted in favor of using regular desktop apps. Mobile apps will return to their original venue, the smart phone, which due to its form factor, cannot push into the same domain as the PC. Interestingly, the laptop or tablet-as-PC cannot displace the smartphone either, again due to the form factor. Note that despite the availability of Google Voice and other similar IP telephony services on tablets, few (if any!) users have abandoned their cell phones to pursue a tablet-only path. Consequently, it's safe to assume that mobile apps will continue to thrive on handsets. The question is to what extent those apps will be different in terms of coding and design from the apps on tablets. The company that has embraced the tablet-PC convergence most clearly, in my estimation, is Microsoft. The Windows 8 release runs on both x86 and ARM processors and the Metro UI brings mobile-style UX to the desktop. (As I found out by running Win 8 on this tablet though, the Win 7 UI is still very much available for users who prefer the traditional desktop metaphor. I expect that for coding, this metaphor will generally be preferred.) By bringing the OS and the UIs across laptop/desktops, tablets, and smart phones, Microsoft is wisely hedging its bets in multiple directions, but especially that tablets like the Samsung Slate will emerge as the new PCs. The bet does extend to phones, however. As described in the immediately preceding editorial, the cross-over between Windows apps for the phone and those for larger devices is significant. That editorial, by Dino Esposito, concluded "If you're coming to Windows Phone with a .NET background, you will feel right at home." I believe Microsoft's Windows 8 goal is to make this true across the entire line of user devices.